SVXY is an inverse volatility fund that can be used as a play when an investor believes that volatility will decline. While SVXY now operates with reduced leverage, it can still produce both strong gains and losses. The VIX Futures term structure is a strong driver of VIX ETPs' price changes and needs to be tracked closely. [Author note: This article was originally published on April 5, 2019 at Trading Volatility]. Six years ago on this blog I wrote "XIV: When A "Sure Thing" Goes Bad, highlighting that the key drivers of Volatility ETPs are 1) the change in price of the relevant VIX futures contracts and 2) the term structure. While XIV no longer exists after last year's blow up, the message is still relevant to XIV's reduced leverage replacement, SVXY. 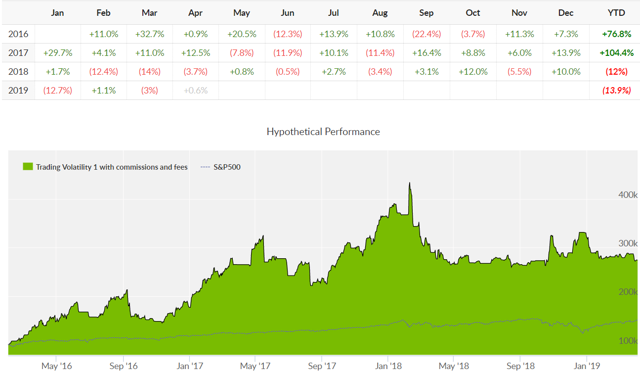 In fact, an alternate title for this post could be "When a "Sure Thing" Goes Bad -- SVXY Edition"Similar to XIV, SVXY is a fund that can be used as a play when an investor believes that volatility will decline. 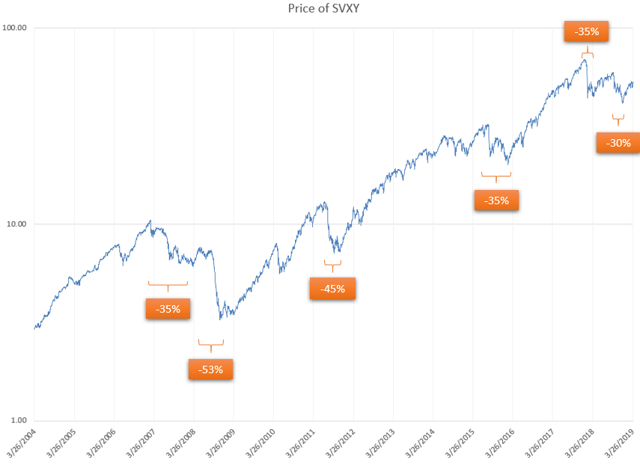 Although SVXY has only half the leverage that XIV had (-0.5x vs -1x), it can still produce strong gains and losses.Below is a chart of the price of SVXY calculated as if it had the -0.5x leverage since 2004 (prices prior to the fund's official leverage reduction have been constructed by calculating the index value using 1st and 2nd month VIX futures data). I've highlighted most of the larger price drops to help illustrate that SVXY is not a buy-and-hold security, even in its reduced leverage form. 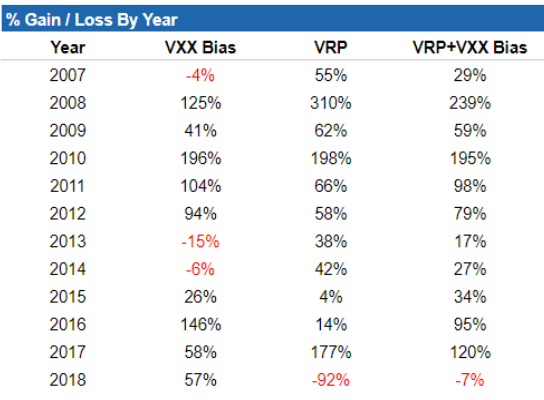 When the market structure changed in 2007 & 2008, SVXY still lost 70% of its value due to strong backwardation in VIX Futures.As long-time readers know, the term structure of VIX futures is what drives various VIX funds, including SVXY, VXXB, UVXY, TVIX, VIXY, VIIX, and ZIV.SVXY performs best in years where there is a strong and persistent contango, the condition where VIX is lower than VIX futures. The best way to measure the degree of contango for these products is to look at the weighted value of first and second month VIX futures as compared to spot VIX. 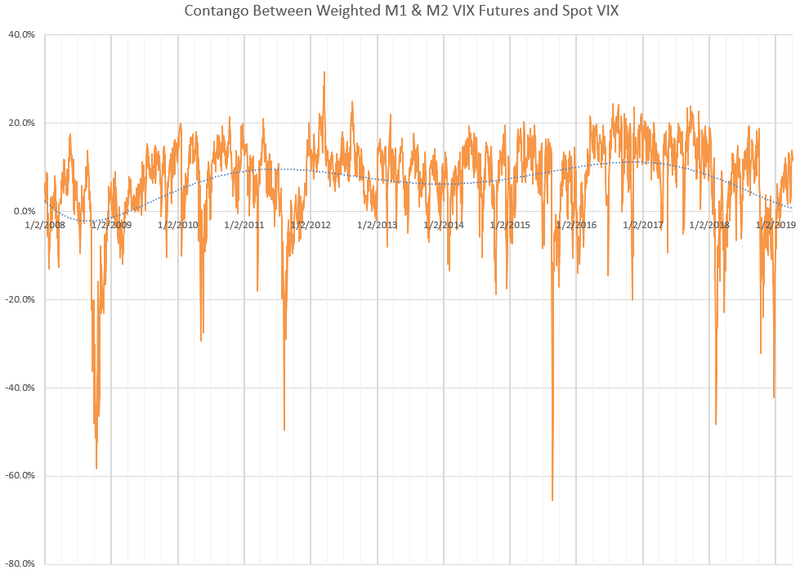 Below is a graph of the weighted VIX futures values to spot VIX over the past 11 years. Clearly not all years are huge winners but the data shows that the use of the term structure data tends to be extremely valuable. 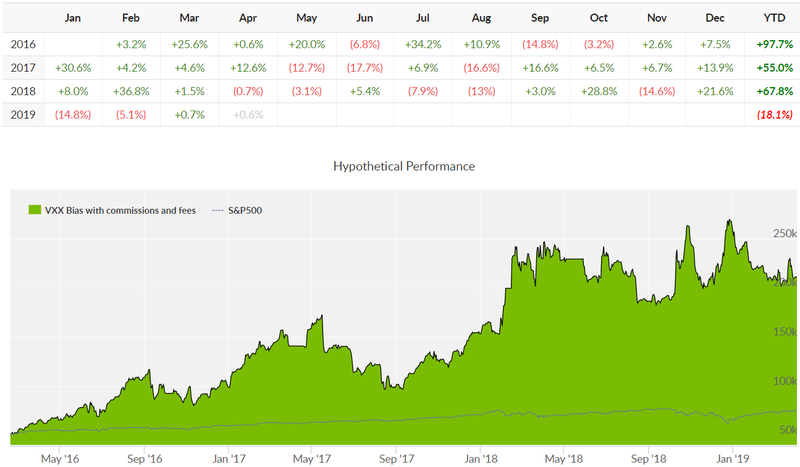 If you are interested in checking out what we offer to subscribers you can view our Subscribe page.One more note: We made a change to our VRP indicator in January 2019 so that it can now be used as a standalone strategy. As such, I am now having Collective2 track that as well. It can be found under Enhanced VRP.------------Hypothetical and Simulated Performance DisclaimerThe results are based on simulated or hypothetical performance results that have certain inherent limitations. Unlike the results shown in an actual performance record, these results do not represent actual trading. Also, because these trades have not actually been executed, these results may have under- or over-compensated for the impact, if any, of certain market factors, such as lack of liquidity. Simulated or hypothetical trading programs in general are also subject to the fact that they are designed with the benefit of hindsight. No representation is being made that any account will or is likely to achieve profits or losses similar to these being shown. Backtest results do not account for any costs associated with trade commissions or subscription costs. Additional performance differences in backtests arise from the methodology of using the 4:00pm ET closing values for SVXY, VXXB, and ZIV as approximated trade prices for indicators that require VIX and VIX futures to settle at 4:15pm ET. Disclosure: I am/we are long SVXY.